The Tobeco Mini Super Tank Sub-Ohm Tank is a compact yet highly capable platform directly based off of the Super Tank series, retaining compatibility with the coil family along with 4ml tank capacity, dual adjustable airslots, and solid construction. The Super Tank measures a standard 22mm in diameter and is compact in height, yet manages to hold a capacity of 4 milliliters of liquid in the tank reservoir. Filling the Mini Super Tank is done quickly and conveniently by unscrewing the delrin drip tip, revealing three fill ports. Airflow features a dual 13mm by 3mm airslot design with six settings that click conveniently into place. Inside, the Super Tank Coil features a vertical coil orientation with two resistances, a 0.2 and a 0.5 ohm, (included 2 x 0.2ohm) that are rated by Tobeco to run up to 100W. 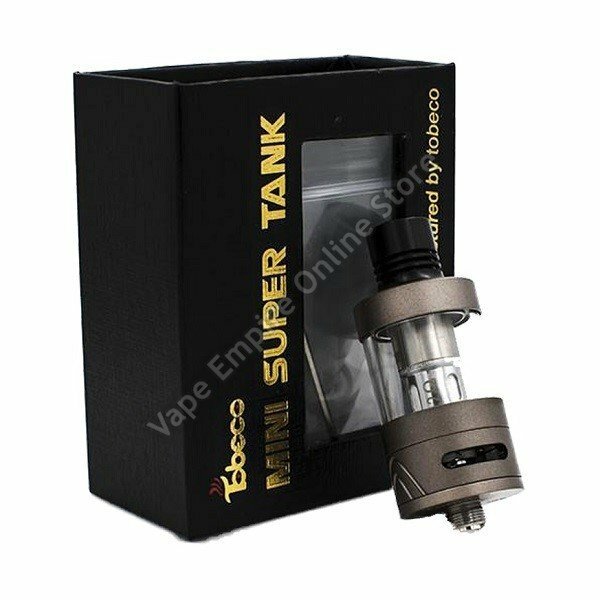 The construction of the Mini Super Tank follows that of the others in the series, featuring a heavy duty stainless steel chassis combined with high quality glass and silver plated contacts for maximum conductivity. With one of the most well balanced overall profiles combined with a high performance coil family and an incredible price, the Tobeco Mini Super Tank is one of the best affordable systems available today. Purchase Super Tank Replacement Coils Here!